All 750 team members at LMS Reinforcing Steel Group make a significant contribution to our business; at the heart of LMS’ ability to serve clients are Stan Rutledge and Robert James. Both have been with LMS since 1998; the work they perform in their respective roles has touched every single one of LMS’ clients and projects. 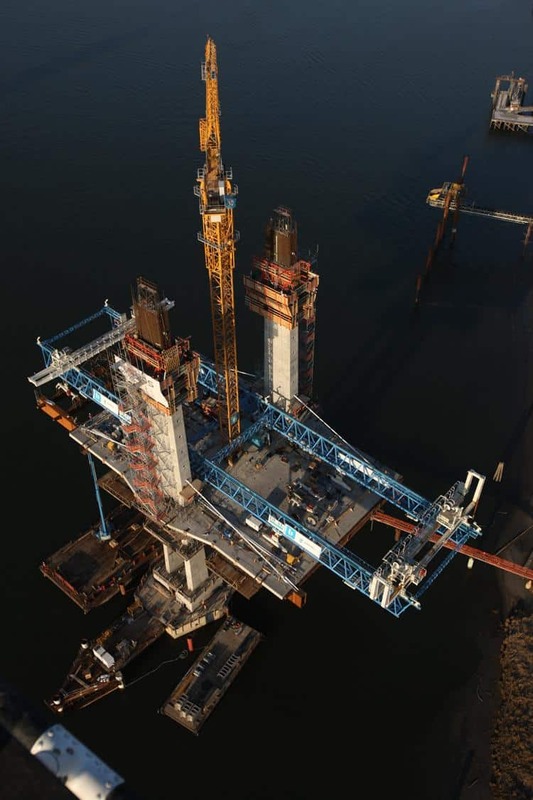 We can say with confidence that over the past 20 years, their hard work and dedication has positively impacted the construction industry in Western Canada. Stan takes pride in being the resident troublemaker at LMS. Not only is he responsible for identifying all the key jobs that LMS bids, but he also ensures there is a fun work environment at the office. He heckles team members to encourage them to go to the gym, brings out their personality when they are really shy and makes everyone laugh on a daily basis. These same qualities are the reason our clients love working with him. He has spent a lifetime working in the construction industry in the Lower Mainland. In 1998, he was a senior representative at Davis Wire Industries Ltd. His friendship with Wally McNeil, a vice-president at Lafarge Canada, was the perfect conduit to meeting Ron McNeil and Ivan Harmatny when they acquired Lower Mainland Steel, which at the time was a failing rebar fabrication yard. Stan still comes to work every day ready with a smart quip—and a smile on his face. Robert has 46 years of experience in the steel trading industry. Since 1998, he has worked tirelessly to ensure LMS has the best sources of steel available for all projects. Since the outset of our business, we have experienced shrinking trading margins, which meant steel traders worldwide had to evolve because trading has become more than simply buying and selling tons. Steel trading requires managing all aspects of identifying supply, negotiating, shipping, financing, risk management, insurance and dock storage. At LMS, Robert leads all components of this activity. In addition to his technical skills, Robert’s astute cultural sensitivity ensures our international relationships are strong and reliable. Robert has worked tirelessly to establish the entire supply of offshore and domestic steel, as well as a reliable, consistent source and high quality supply of rebar that meets Canadian regulations. He manages all aspects of the steel from FOB to the docks in Vancouver and California—and possesses an astute understanding of the intricacies of all stages of the purchasing process. Above all, Robert understands that this is a people business. His cultural awareness and sensitivity have been key factors in his ability to build strong, reliable and trustworthy relationships with international partners. This business began in 1987 with a couple of young rebar installers with a pickup truck, says Ron McNeil, CEO and numerous callbacks reminding the customer they are making a co-founder of LMS. 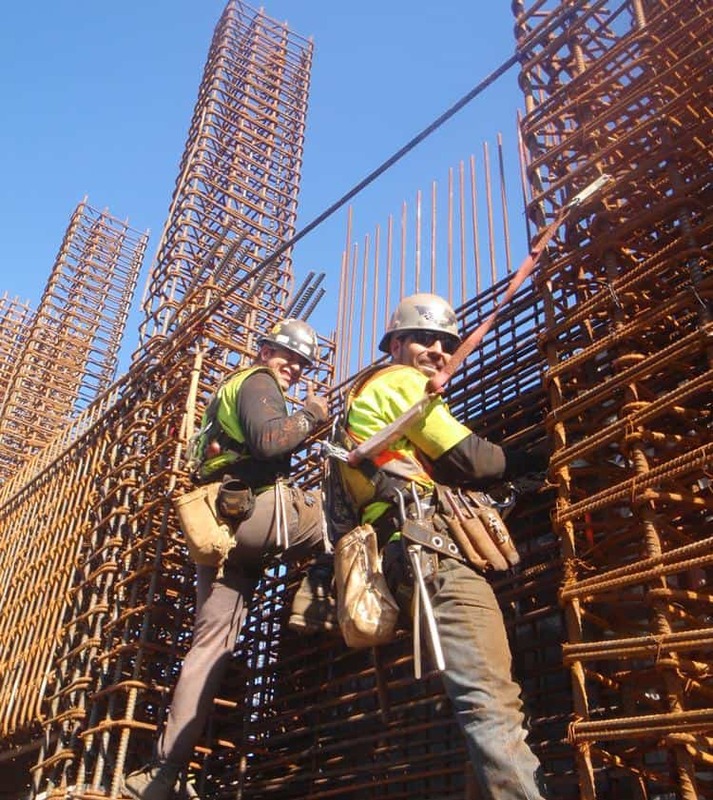 “We grew our installation company to 80 employees and, in 1998, we took a gamble and decided to integrate rebar fabrication with site installation. 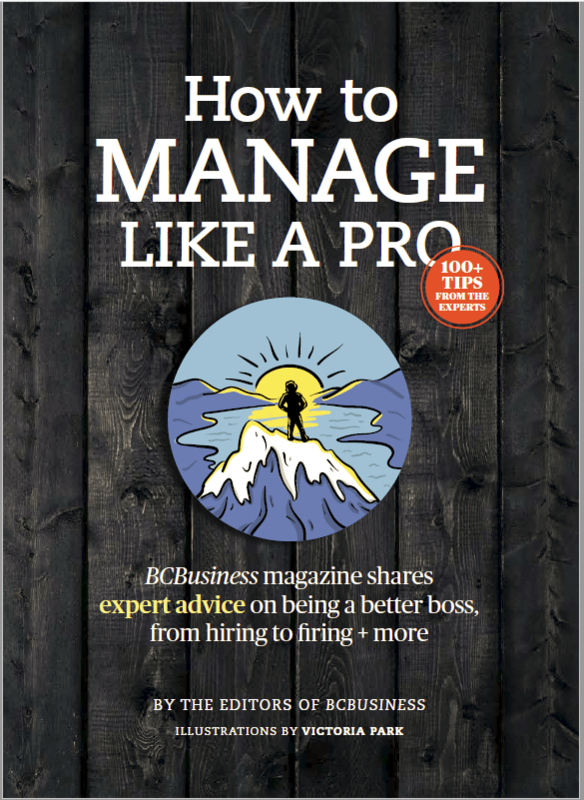 “We purchased a failing fabrication yard and kept the name Lower Mainland Steel for its marketplace recognition. That gamble paid off, in large part because of three titans in our industry—Wally McNeil, Stan Rutledge and Robert James. Wally passed away in 2010, but not before leaving LMS on a strong foundation for success. After a lifetime in the rebar industry, Wally helped LMS secure a bank line with the Bank of Montreal (which was critical in our ability to source steel) and introduced us to our new salesman, Stan Rutledge. “Ivan and I had concerns; in 1998 our new salesman was 66 years old! Twenty years later Stan continues to dig up projects and work his phone, always with a smile and occasionally a joke more suited for 1965. He’s an old-time relentless salesman. He does not take no for an answer and he does not shy away from making numerous callbacks reminding the customer they are making a mistake if they don't choose LMS. "We knew we had to learn the ins and outs of running a fabricating business and sourcing steel was going to be a key component of turning this business around. Upon joining the LMS team, Stan introduced us to Robert James, who at the time was a leading steel trader for Thyssen Canada Ltd.
for LMS. He performs a critical role for our business development team. His work ethic is legendary as he keeps me motivated each day. On the occasion we miss a quote, even a small home foundation, Stan is quick to remind me we have let a potential customer down. Each and every member of our organization can learn from Stan’s example. His work ethic is second-to-none, he enjoys his job and makes everyone in the office laugh. He takes the time to help everyone learn about this complex and demanding industry that we are in. Since joining our team in 2004, Robert has been at the helm of our import activity. We have sourced 1.5 million tons of reinforcing bar, which equates to nearly $1 billion. It has been my extreme pleasure to work closely with Robert for the last 20 years on all buying decisions. He has a remarkable ability to navigate the ever-changing steel trading environment. This ability as a significant asset to both LMS and our clients. Everyone at LMS would like to thank Stan and Robert for their exceptional service. Their contribution impacts the success of our entire business. Ron McNeil—LMS required some studrails for one of their jobsites. Once we started manufacturing for LMS, we were both introduced to Stan. It was apparent that he was incredibly knowledgeable and knew almost everyone in the construction industry. Stan started advising us right away on how the business worked and also introduced us to key personnel that expanded our business. Stan has always struck me as the perfect bridge between LMS and all of their valued customers. He is a shining example of what helps make LMS such a success and he has earned himself a tremendous amount of respect from the entire industry. Robert has diverse experience throughout the entire steel manufacturing and trading process—he understands the ins and outs of steel mills and fabrication shops, he has a strong sense of the steel market fluctuations, and all the requirements for steel trading. Robert is very knowledgeable and effectively builds mutual understanding and trust between all parties. He understands the cultural requirements in different countries worldwide. If there were a Nobel Prize for trust, he would win. Without mutual trust, business will not sustain the test of time. Our long-term relationship with Robert and the rest of the LMS team is a testament to Robert’s focus on respect, cultural understanding and professionalism. I’ve known Stan since I started my career in estimating 16 years ago. As an estimator, you need to make a lot of trade phone calls on a daily basis on pricing, unit rate updates and markets. Stan was one of my favourite phone calls. He is always very pleasant to talk to, helpful and, most importantly, he always follows up and never misses a deadline. I’ve asked Stan several times: “Why are you still working?” His response was always the same: “What am I going to do at home?” That phrase alone gave me the boost I needed for the rest of the week. Since the outset, Robert knew what was required in order for LMS Reinforcing Steel Group to succeed and achieve greatness in this marketplace and he is always one step ahead. To quote Wayne Gretzky: “I skate to where the puck is going to be, not where it has been.” Robert is the Gretzky of the steel trade and it has been a pleasure working with him over the last 20 years. We wish Robert continued success! I’ve been in correspondence with Stan since I first started in the Head Office with Surespan Construction eight years ago. From Day 1, Stan has treated me with the utmost professionalism and courtesy. I have always looked forward to my correspondence with Stan as I know each time I do I will learn a bit more about LMS and the industry in general. In the busy grind of the estimating world I always felt it gratifying spending a few extra minutes to chat with him. It has been a pleasure to get to know him throughout the years. Sasha Ford, Chief Estimator Surespan Construction Ltd. It has been a distinct pleasure to deal with Robert over the years. Not only did he represent LMS in the best possible light, his depth of character and deep knowledge of and experience in steel trading was evident in every interaction I had with him: A true icon of the steel-trading Industry. Sean Bartos, Vice-president, Stemcor USA Inc.
You are always guaranteed to hear a friendly voice and have an enjoyable quick chat when you call Stan. You are also guaranteed to have whatever issue you face to be followed up by Stan in a very efficient manner. Stan has been great to work with. Robert has been a stalwart of the industry with his integrity throughout his entire career. He conducts business with the utmost in ethics and sincerity. It has been a pleasure to work with him and solve all the challenges together. Stan and his attention to each and every customer’s needs is second to none, and a testament to what he has contributed to LMS, in alignment with the culture that both Ron and Ivan value. I have not seen Stan for many years, but I am so glad to hear that he is still adding value and integrity to our industry. He is one of the great ones in this business! Robert’s accumulated knowledge continually astounds me. A lifetime of steel trading has given him a breadth of knowledge of everything to do with acquiring steel. His field of expertise is substantially more than one might imagine, and through his years of experience Robert has developed a clear understanding of every moving piece. 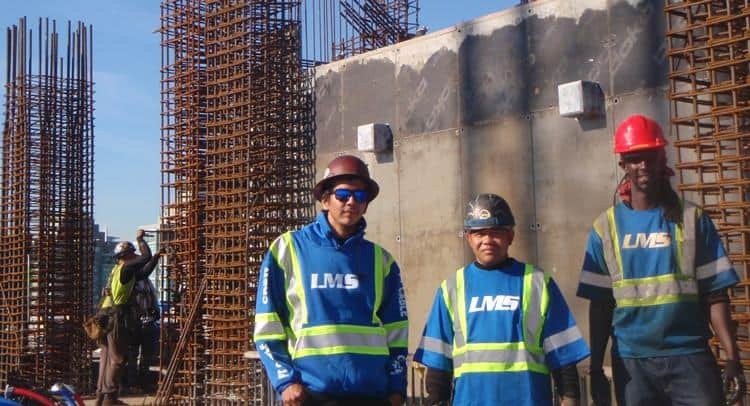 About LMS: Leading fabricators and installers of reinforcing steel and post-tensioning.